Do You Really Think They Won’t Be Bailed Out? C’mon world of finance! Get a grip. Lehman comparisons. End of world talk. It’s all so laughable. While Deustche Bank going down in flames within weeks would certainly step up the timetable on a global depression; ask yourself. Does that seem logical? No, of course not. They will be bailed out. Just because Merkel came out and said that a direct bailout of Europe’s largest public bank is untenable, doesn’t mean it’s not going to happen. Remember. “When it becomes serious. You have to lie.” Period. End of story. Politics 101. A backdoor bailout of Deustche Bank will occur. It’s guaranteed. Anybody remember this little document put out by the German central bank in July, just a couple of months ago? 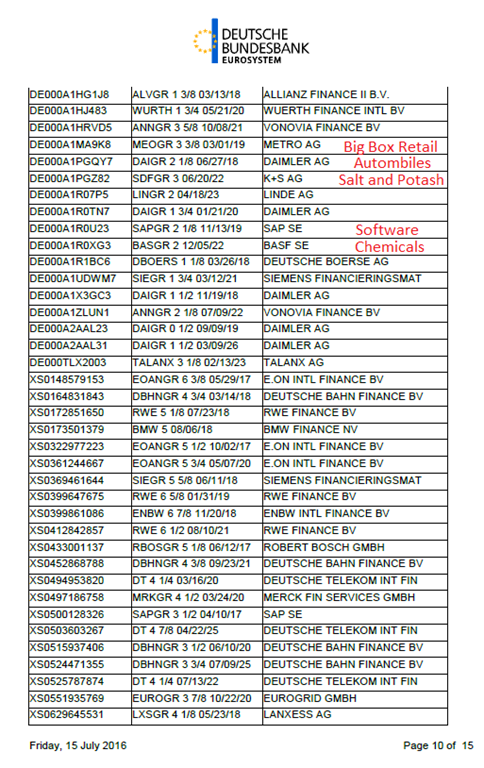 It’s the inaugural listing by the Deutsche Bundesbank sharing their listings of investment grade bonds they purchased. Who say’s they can not purchase junk bonds? Equities are on the table. When you’re pumping out that much stimulus via the ECB, it has to go into something as there simply isn’t enough supply of quality sovereign debt to purchase. The bonds of the staples of the German business world and economy are on the German central bank’s balance sheet available for lending. Which from my last post, you know what that means. I suspect because the issue is so white hot, front and center to the world that the Bundesbank will not directly purchase a new bond issue or equity rights offering from Deutsche Bank. However, that doesn’t mean that the ECB can’t put together a syndicate of Deutsche Bank counterparties to their insane derivative book and insure wholesale funding for purchases of dilutive financing or share issuances to support Deutsche Bank’s capital level. I’m sure it wouldn’t be too hard to convince JPM, Citi, Goldman, BofA, HSBC, and let’s throw in Belgium too to come up with wholesale funding in order to buy newly issued debt and shares. It’ll be perceived as the banking world trying to maintain the safety of the entire banking system and world economy. Really, it’s just a grab for more time to stave off the inevitable market and economic collapse. So relax. Deustche Bank ain’t going down yet. Go short those Deutsche Bank credit default swaps zipping up in value currently? Close out your put strategies. The music will continue to play and you must get up and dance. DANCE PUPPETS!